I had to add a new caregory for this craft as I had never done anything like it. With a general theme like Home Decor I will be able to add a variety of crafts under this heading. I thought that was pretty cute and went to Dollar Tree to see how much of the supplies I could come up with. - I could get the blue sand there but really wanted regular sand. That I had at home already. I already had E6000 glue and sheet magnets and clear acetate so I was ready to tackle the project. First, I mixed my two sands together. Some was from Maui and some from the Oregon coast. I poured 1/3 of it into each of the three wine glasses. I sorted the shells so I had the same mix in each glass - a variety of sizes and types. Then I applied a line of E6000 glue around the rim and added a square of clear transparency acetate. 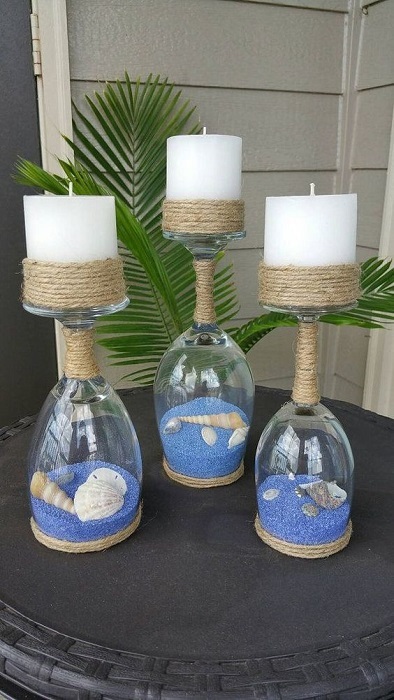 This seals in all the loose sand and shells for when the glass is turned over. While that was setting up I glued several rounds of twine around the base of each candle. I used the E6000 glue for this, too. In fact the same glue is used for every step of the whole project. After allowing both of these steps to dry overnight, I turned the glasses upside down and glued several rounds of twine at the rim where it meets the acetate. I used scissors to trim the acetate next to the twine on the glass. The candles were pretty slippery setting on the foot of the glassware so I used some sheets of magnet to cover the foot and then glued a ring of magnet sheet on the candle base. This had to be a ring so the battery access door and the on/off switch could still be accessed. To display, a glass is centered on a mirror base and a candle is turned on and set upon the foot of the glass. Like the Etsy listing, I made a set of three, but mine are all the same size instead of the varied glassware they used. I really like how the project turned out. I may shop at a larger Dollar Tree to see if I can find more of the elements there. I know they've had all of these things at one time or another.